After a catastrophic car crash, a young woman (Mary Elizabeth Winstead, Scott Pilgrim vs. The World) wakes up in a survivalist's (John Goodman, Argo) underground bunker. He claims to have saved her from an apocalyptic attack that has left the outside world uninhabitable. His theories are supported by a mysterious stranger who is in the bunker with them (John Gallagher, Jr., The Newsroom), but as his increasingly suspicious actions lead her to question his motives, she'll have to escape in order to discover the truth. Over 30 minutes of Behind-The-Scenes Footage: Take an extensive look behind-the-scenes with Abrams and the cast as they revisit the legacy of 2008's Cloverfield, and discuss how 10 Cloverfield Lane went from script to production. Continue with a tour of the ominous bunker, see how the costume designer was challenged to create a homemade Hazmat suit, follow the production team and sound designers as they work on the movie's epic finale, and hear the unique scores composed for each character. '10 Cloverfield Lane' comes so close to being a 'great' movie it's frustrating that the filmmakers didn't see their mistake. After almost 90 minutes of fantastic storytelling, the film gives us a wild final 15 minutes that are so different from what proceeded it that it would have sunk any other flick. And why? All so that Producer J.J. Abrams could tie this story – which was originally a standalone tale – into his Cloverfield universe, and make this a semi-sequel to the 2008 monster movie. Fortunately, everything up to this bizarre turn in events is so good, even it can't take away from the fact that '10 Cloverfield Lane' is one of the best films of the year. The movie stars Mary Elizabeth Winstead as Michelle, who is packing up and leaving her boyfriend in New Orleans as things get underway. She heads through the countryside of Louisiana, only to get involved in a horrific car accident. When she comes to, she finds herself imprisoned inside what she will soon learn is an underground bunker. The man holding her there is named Howard (John Goodman), who claims he nursed her back to health but can't let her go...because there's no one else left alive up in the real world. The two aren't there by themselves, though. Howard is also providing shelter to Emmett (The Newsroom's John Gallagher Jr.), who says he witnessed part of the attack above ground and believes Howard's story that the bunker is the only safe place for them. But can Howard be believed...or, for that matter, can Emmett? 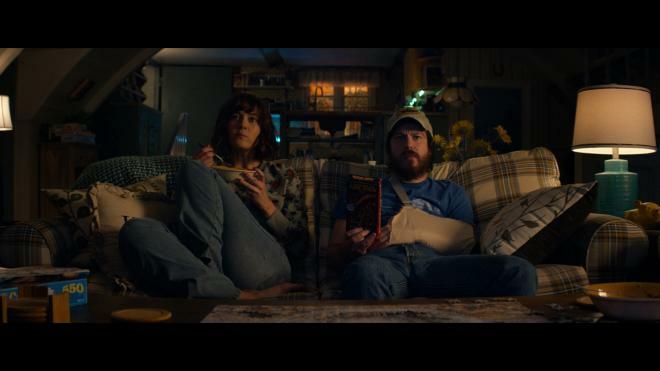 Part of the fun of watching '10 Cloverfield Lane' is in joining Michelle as she attempts to figure out if Howard is trustworthy or just plain crazy. The film really gets interesting when viewers learn that the answer could, in fact, be both. There are essentially only three actors in '10 Cloverfield Lane' and all three of them are fantastic in their parts. Those in Hollywood who claim there are no strong roles for women anymore need only look to this film and Winstead's acting. And Goodman is simply marvelous – giving a performance that I hope isn't forgotten (but no doubt will be) once awards season begins later this year. He's both likeable and untrustworthy at the same time, which isn't easy to pull off. Gallagher is great too. In a part where he's just basically required to play an ally to the Michelle character, he spins it just enough – not with his dialogue, but just with little looks or mannerisms – that we wonder if he's perhaps the villain we need to be concerned about. There's a very Hitchcockian feel to the whole proceeding that almost crashes and burns when Michelle decides to escape the bunker. I'm not going to reveal if she gets out or what she might find on the outside, other than to say that the attempt to live up to the 'Cloverfield' name was a horrible decision that falls almost exclusively at the feet of Producer J.J. Abrams (who is usually smarter than this). The last act of the movie may thrill fans of the original 'Cloverfield' (although the connection isn't as clear as one might guess), but it really has no place in this story. 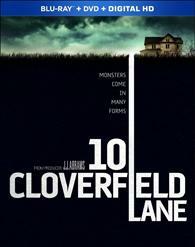 Those willing to trace the history of '10 Cloverfield Lane' will discover it was never intended to have a 'Cloverfield' connection at all, but instead was called 'The Cellar'. Abrams came up with a way to insert the original idea into his 'Cloverfield' universe and this is the result. Yes, I suppose the connection helped the movie make a lot more money than it might have it were just shot as originally written...but is it a better movie because of the change? I don't think so. Despite all this, '10 Cloverfield Lane' currently stands as my favorite movie (to date, as the year is only half over as of this writing) of 2016, which should tell you just how strong this story is until its disappointing conclusion. I'll give credit to Director Dan Trachtenberg for defending his film though. In the commentary on this release, he simply states that there are plenty of other movies that don't have crazy endings to them...and suggests to go watch them instead. If it's all the same Dan, I'll stick with your excellent film, even if it falls just short of being a classic. All in all, though, not bad for one's feature film debut. '10 Cloverfield Lane' escapes onto home video with this Blu-ray/DVD/Digital HD release. The 50GB Blu-ray and dual-layer DVD are housed inside an eco-friendly Elite keepcase, along with an insert containing a code for either an UltraViolet or iTunes digital copy of the movie. The most controversial part of the packaging is the slipcover that slides overtop the keepcase (whose artwork is different from the keepcase's in that it shows stars John Goodman and Mary Elizabeth Winstead, while the keepcase slick just shows the house as seen in the theatrical poster). For whatever reason, Paramount has designed the slipcover so that it only covers about two-thirds of the front of the keepcase. It's full-sized on the back, but rounded on the top edges instead of squared off. I suppose Paramount would say they wanted to create an innovative slip cover design, but chances are good that they saw an opportunity to save a few cents on each slipcover and went for it. It seems like every year some studio comes up with an annoying packaging design decision. '10 Cloverfield Lane' is an early front-runner for the worst of 2016. Anyway, there are no front-loaded trailers on the Blu-ray, although the DVD contains front-loaded trailers for 'Star Trek Beyond', the upcoming remake of 'Ben-Hur', and 13 Hours. The main menu design is the same on both discs – a still of the keepcase's cover art (minus any text or the movie's title) with menu selections running across the bottom of the screen. In additon to this Blu-ray combo release and a standard DVD release, retailer Best Buy is also offering up a nice-looking exclusive steelbook for the movie if you can find it. '10 Cloverfield Lane' was shot digitally on Red Epic Dragon cameras and is presented here in the 2.40:1 aspect ratio. The quality of the transfer is about what one would expect for a digitally shot movie, but not without faults – at least one of which is from the original master and not this 1080p transfer. There's a scene early on in the movie where the camera takes a long, left to right pan of the bunker in which the characters will spend most of the movie. There's an obvious judder to the picture as the pan is taking place. This problem existed in the original prints of the movie and it's an issue that Director Dan Trachtenberg talks about on the audio commentary of the Blu-ray – saying he tried the shot several different times, but could never get rid of that judder. There are other problems with the image as well. Some aliasing occurs here and there. Mild noise can be noticed in the background of many sequences. Black levels are decent, but they're by no means inky deep – resulting in some murky-looking shots. How much of this is due to the Red Epic Dragon camera and how much is due to this transfer is anyone's guess, but my money is mostly on the source material. But despite the issues mentioned, which again I believe are almost exclusively from the master, the Blu-ray of '10 Cloverfield Lane' proves to be a pretty accurate rendition of how the movie looked on theater screens. Despite being shot digitally, it's not supposed to be a bright, well-detailed and colorful movie, and this transfer properly conveys the intended palette and tone the filmmakers desired. The featured track here is an English Dolby Atmos one, which plays in 7.1 TrueHD for those without Atmos set-ups. While the audio here is just about perfectly rendered, aside from a car crash early in the movie and the quite active climax to the film (the last 10 to 15 minutes), there's not a whole lot to get excited about as a big chunk of the story just consists of characters talking to one another (although, to be fair, composer Bear McCreary's score is noticeable and impressive throughout). Dialogue throughout is front and center, with the rears used to enhance the musical soundtrack (including the use of 'I Think We're Alone Now', which was also used in the trailers). Rears are used for distinct and noticeable ambient sounds, but as I noted above, one doesn't get the full effect of this track (other than that opening car crash) until the final act of the movie, and then be prepared to be wowed. So even though the audio is rather wonderfully reproduced here, I'm holding back from giving the audio a reference-quality score. Yes, there's some great creaking throughout that's eerily good and a few other audio suprises during those bunker sequences, but for the vast majorty of the movie, this is mostly a non-aggressive track, albeit a very clean and well-produced one, with no glitches of which to speak. In addition to the Atmos track, the Blu-ray also includes 5.1 Dolby Digital tracks in Spanish, French, and Portuguese, as well as an English Descriptive Video track. Subtitles are available in English SDH, English, Spanish, French, and Portuguese. Audio Commentary with Director Dan Trachtenberg and Producer J.J. Abrams – To date, I've heard a number of commentary tracks with J.J. Abrams involved and have yet to hear a bad one. He's always got something interesting to say and/or joke about. Here, the producer of the movie joins the director for a commentary that gives a lot of behind-the-scenes stories as well as plenty of information about how each sequence is shot. What's not touched upon, however, is the exact relationship between this film and the previous Cloverfield, so those looking for a definitive answer as to whether this is a direct sequel, prequel, or something else to that film won't find it here. Featurettes (HD, 34 ½ min.) Paramount has divided this up so each segment can be watched individually (and give the impression that this disc has more bonus features than it really does), but this is really just a single featurette with multiple sections (which viewers can also chose to watch in its entirety). It consists of seven segments as follows: 'Cloverfield Too' (9 min. ), 'Bunker Mentality' (4 min. ), 'Duck and Cover' (2 min. ), 'Spin-Off' (4 min. ), 'Kelvin Optical' (6 min. ), 'Fine Tuned' (6 ½ min. ), and 'End of Story' (3 min.). This featurette includes comments from the cast and crew, including a very 'spolierific' John Goodman – so be sure to watch this after you've seen the movie. It's a shame that '10 Cloverfield Lane' doesn't quite stick its landing, as otherwise it might be one of the best suspense movies ever made. Even as it stands, this a really good film and one of the best we've seen so far in 2016. While this Paramount release is a little stingy when it comes to bonus materials, that shouldn't stop anyone from adding this to their permanent collection. Highly recommended.